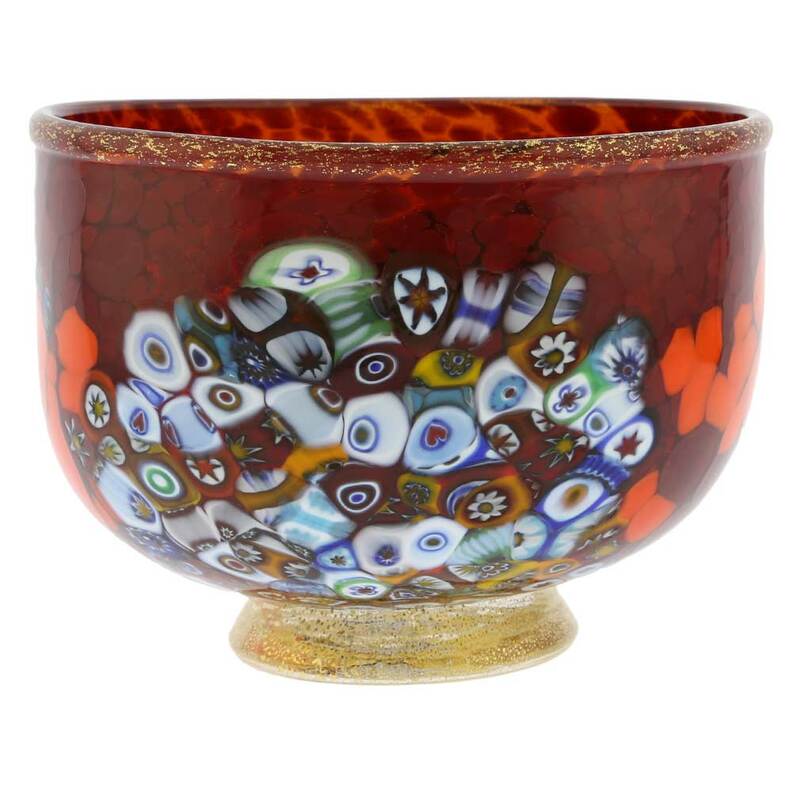 This magnificent blown Murano Glass Bowl features rich colors with extraordinary depth and radiance and presents a fine example of the most famous ancient Murano technique- Millefiori (a thousand flowers). 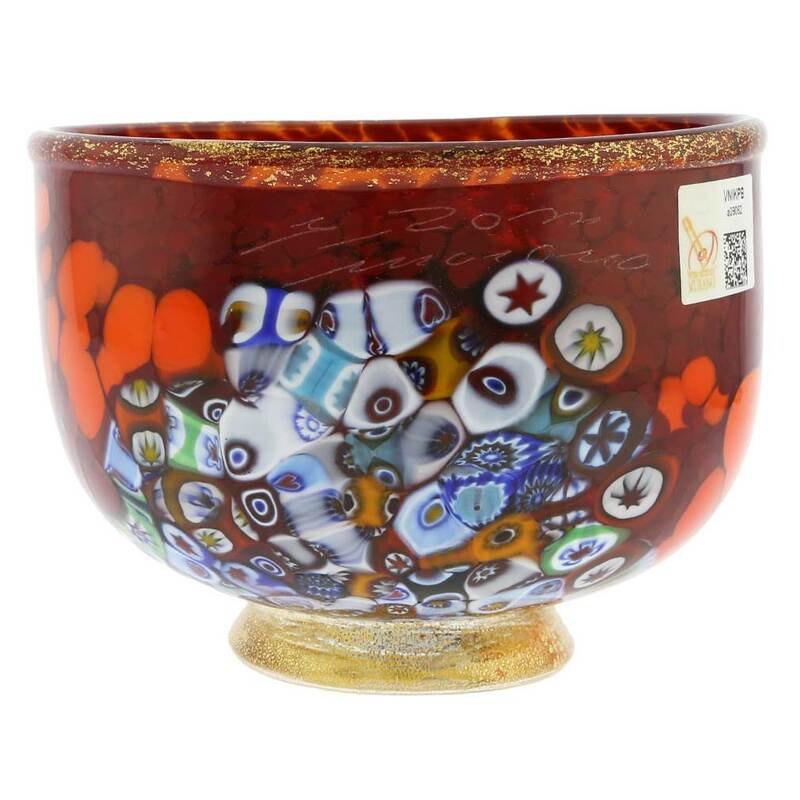 Inclusions of vivid Millefiori flowers, rich ruby-red hue, and generous 24K gold dusting on the base and the rim of this Murano bowl reflect the opulence and luxury of renaissance Venice. 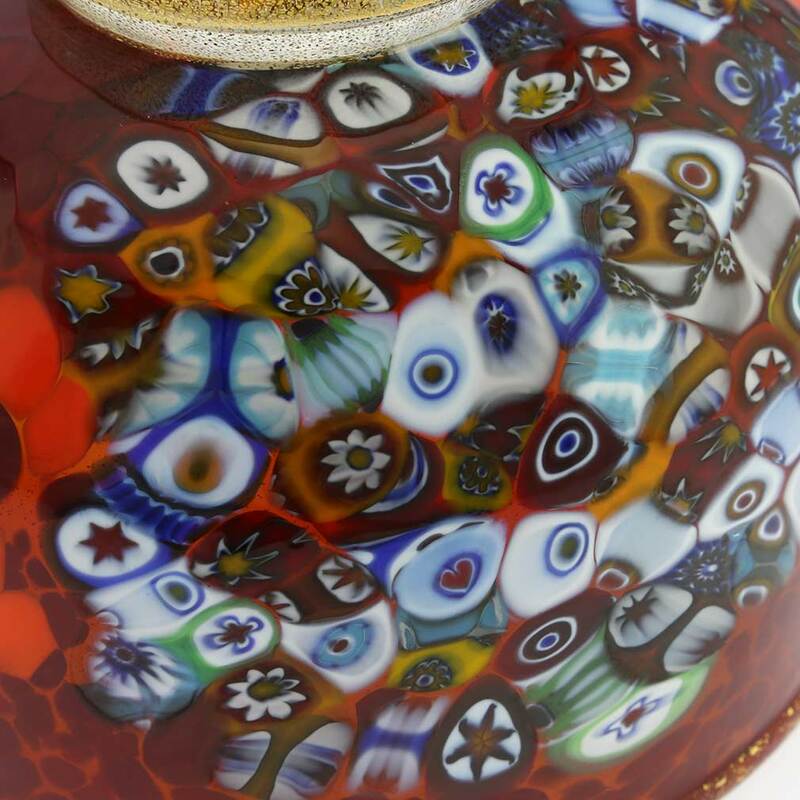 This beautiful authentic Murano Glass bowl was created entirely by hand using only traditional Venetian glass-making methods by a third-generation Murano maestro, whose works are featured at exhibitions, private collections, and in museums worldwide. This vase makes a perfect centerpiece for your table, and can be used to serve sweets or fruits in style. It offers a great way to wow your dinner guests and add a touch of famous Italian design and Venetian opulence to your home. 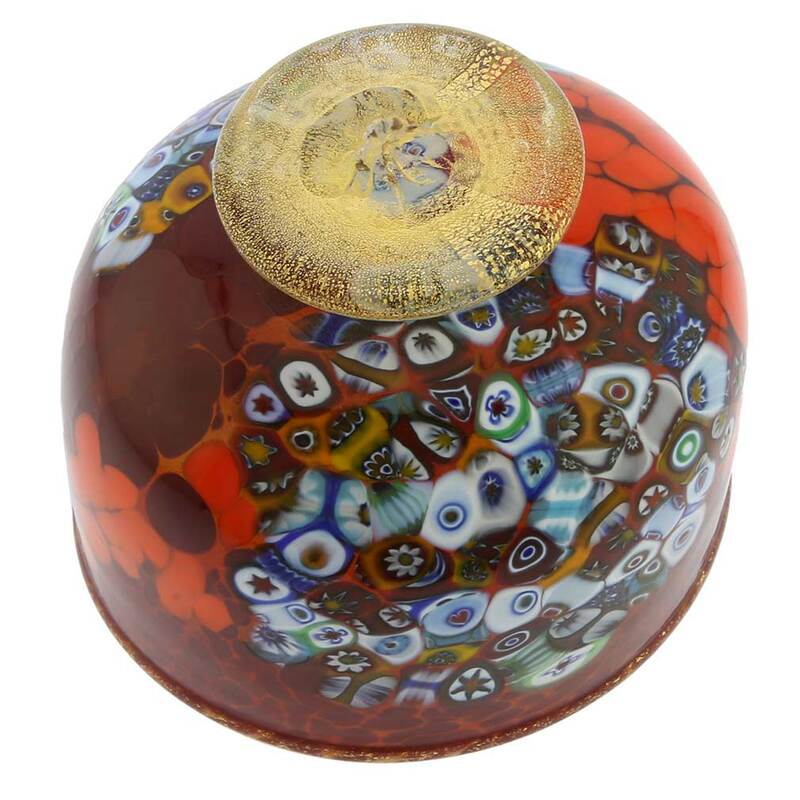 This gorgeous Murano bowl also makes a uniquely appropriate gift for weddings, birthdays, anniversaries, Christmas or Mother's Day as it is truly a one-of-a-kind piece of art. The Venetian vase/bowl is approximately 4 inches tall and 5 inches in diameter. It has etched signature of the master on the side. Attached sticker further proves the bowl's Murano origin, as does the certificate of authenticity that comes with it. 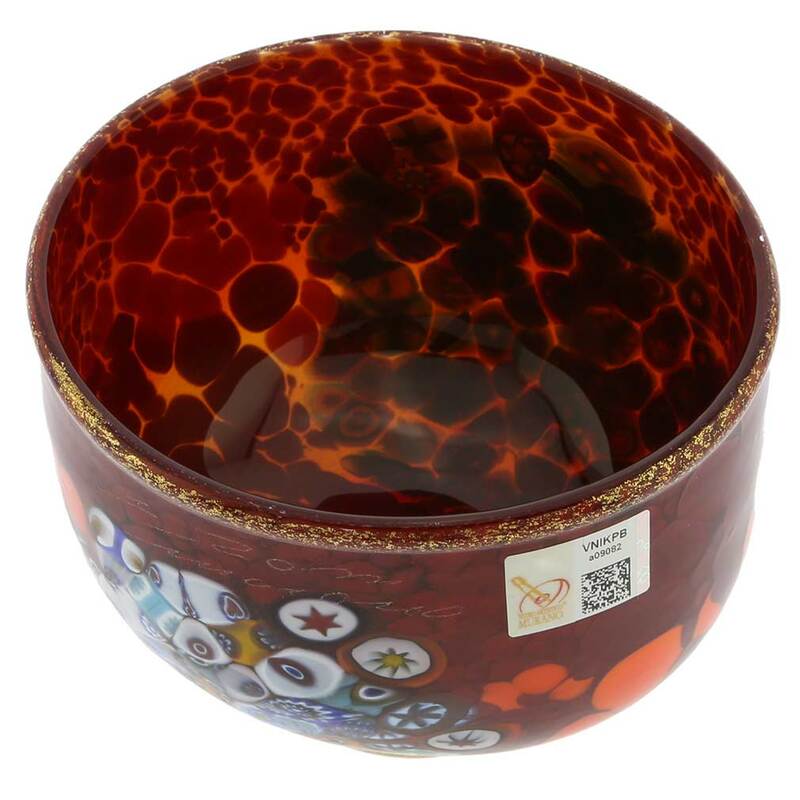 Make sure you check the dimensions - this is a very SMALL bowl so it needs a more focused display area than the bigger pieces like the ART GLASS VASES in blue and orange. It is a great unique piece and love that deep red. Received this bowl last week. It was perfect! Love that we have an actual piece of authentic glass from Venice. We're going to Venice this summer and now I won't have to worry about getting a purchase home in one piece. Thanks for a job well done!